When the Leafs won the Cup in May of 1967, they were a team on the decline. They had given everything they had to nudge past Chicago and Montreal that spring, and there was little left in the tank. Like every other Original Six team, they had to prepare for the expansion draft, and were destined to lose valuable pieces, including Bobby Baun and Terry Sawchuk. On the surface, it seemed like an outstanding trade. The Leafs needed to continue to make over the roster (they had brought in capable young players such as Ron Ellis, Mike Walton, Brian Conacher and Pete Stemkoswki in previous years) and Oliver was a clever player in his prime. 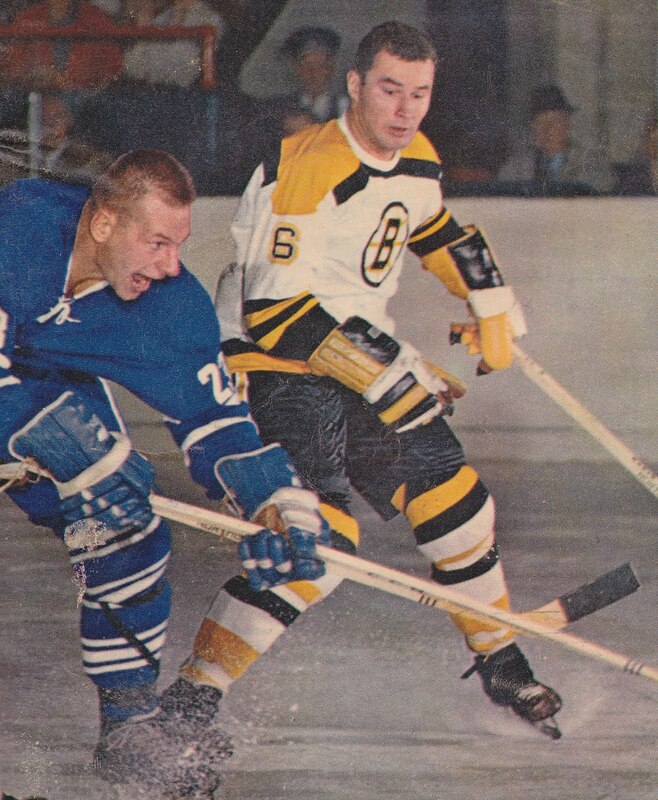 Shack (pictured above with Boston's Ted Green in a great Harold Barkley photo, circa 1964) had become an expendable player, it seemed, though he played a part in the four Cups the Leafs had won up to that point. Oliver was a good-skating, hard-working playmaker who was a better overall forward than Shack. But somehow things didn’t work out. Shack had been at least a physical presence and a player who could distract the opposition. Oliver did not bring a physical dimension to his game and never seemed to fit in Toronto, though his statistics were not bad with the Leafs. He was a small guy playing on a team that had a lot of small forwards. That said, he later went on to be a significant contributor with the Minnesota North Stars, but it just didn’t pan out in Toronto. For his part, Shack was part of the “Big Bad Bruins” for a couple of seasons when they were developing their new identity in the late ‘60s. He then played a year in LA before finding good fortune alongside rookie phenom Gilbert Perreault in Buffalo in the early ‘70s. He returned to the Leafs under coach and former teammate Red Kelly later in the ‘70s, but was not a regular at that point. But back to the Leafs. Imlach was often criticized for letting the Cup-era Leafs grow old, but he did bring in new blood like the young forwards mentioned above. 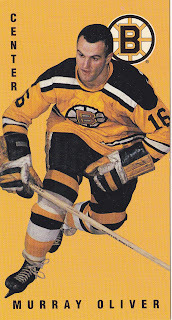 He also promoted some young defensemen including Mike Pelyk, Rick Ley and Jim McKenny. He probably had the right idea when he dealt Shack, but sometimes trades don’t work out the way you envision. I credit Imlach with trying to at least do something to rejuvenate the Leafs before they fell back again, but the integration didn’t take effect soon enough. It wasn’t until the 1970-’71 season—under new management—that the Leafs made the playoffs and began to turn the corner again, albeit just ahead of the WHA grabbing players and another lost season in 1972-’73. As for the Leafs and their plans now, trades have always been and will always be important. They can change the identity of a team (e.g. Phaneuf) or cause entertaining, ongoing debate (e.g. the Kessel deal). GM's are fond of saying the best trades are often the ones you don't make. In the case of Kaberle, it will take some time to determine whether the Leafs have handled this as well as they could have. Nice read. 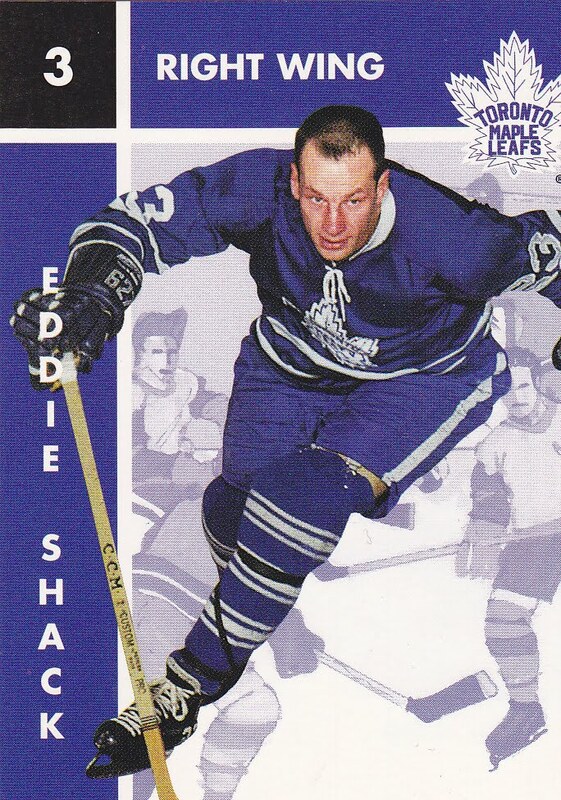 Shack had become very expendable by the time he left the Leafs. In 1967 he barely hit the ice in the finals, being dressed as an extra forward. If you watch the final game of the '67 playoffs you only see Shack hit the ice after the game is over. Oliver I remember in his Leaf days primarily as a defensive left-winger playing beside Keon. A good solid all-round player but, as you wrote, didn't really fit in well and showed his best only after going to Minnesota. That's what I remember of Oliver as well- playing alongside Keon, with Pulford on the other side for at least part of the first couple of seasons that Murray was with the Leafs. Not the best match, three centers on the same line. Oliver indeed had some fine years later with the North Stars. As I recall he was more of a leader there and it was a more comfortable fit.